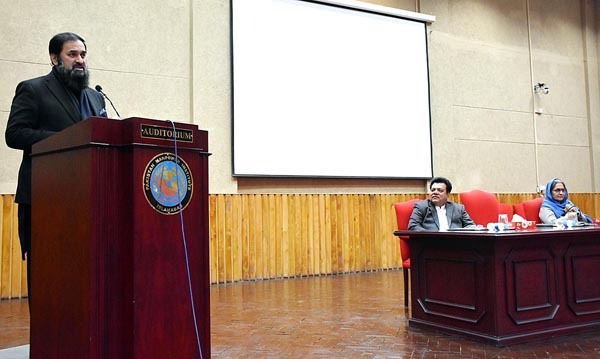 ISLAMABAD, Jan 19 (APP):Federal Minister for Education and Professional Training Muhammad Baligh-ur-Rehman Friday said Sindh Madressatul Islam University (SMIU) had continued its mission of imparting quality education to its students for the last 133 years. He said this while addressing a delegation of the SMIU’s National Leadership Programme led by Vice Chancellor Dr Muhammad Ali Shaikh here at the Ministry of Education and Professional Training, a press release said. The minister praised the efforts of Dr Muhammad Ali Shaikh for providing students a platform to explore important institutions of the country that could help students to develop various analytical, logical and communication skills. He informed the delegation that teachings of the Holy Quran had been made part of the curriculum from nursery to intermediate level. He said the character building of students was as important as education was itself, therefore, educational institutions had to play important role in this regard. “Youth is powerful dividend that this country is blessed with, while many other countries are deprived of this powerful segment,” the minister said and added it was essential to guide the youth about their goals and to develop a collective approach for maximum benefit of the society. He advised the students to abide by virtues of perseverance in face of trials and tribulations. He was also of the view that due to undemocratic regimes, democratic traditions could not hold the ground and the country suffered both economically and socially. He hoped that with the growing economic development in the country, unemployment and other issues would be resolved. Dr Muhammad Ali Shaikh said the youth of today was without any direction, thus to reorient their path towards the loftiest objectives of morality, leadership and ethics, therefore, the National Leadership Programme was conceived. He also informed the minister about the visits of the students of SMIU taken so for under the NLP. Director General of Pakistan Manpower Institute Khalida Gulnar was also present on the occasion. Earlier, the delegation was warmly welcome upon arrival at the ministry. It was the third consecutive visit of SMIU’s students to the office of Federal Minister of Education, in the last three years. Moreover, the other day Chairman of Higher Education Commission, Prof Dr Mukhtar Ahmed hosted a reception for the SMIU delegation.